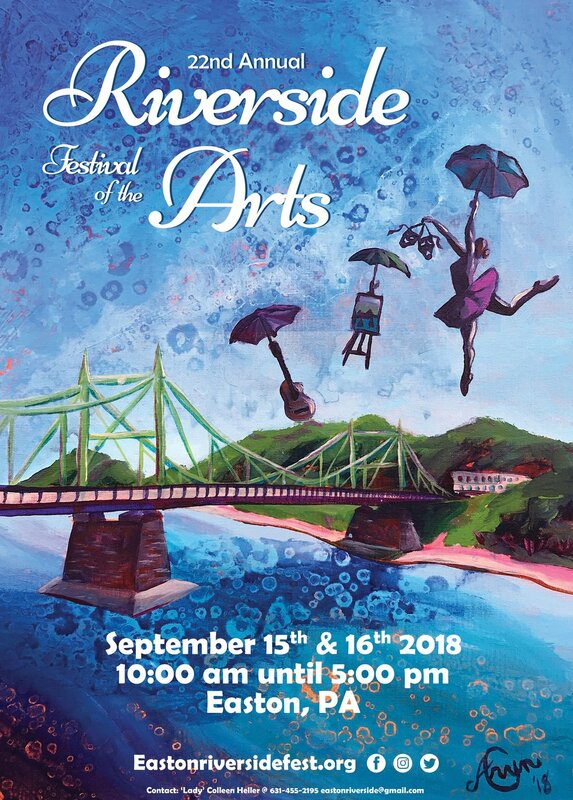 Easton Riverside Festival of the Arts returns this weekend to the banks of the Delaware and Lehigh rivers for the 22nd annual celebration of all things art. The event will be held 10 a.m. to 5 p.m. Saturday and Sunday at Scott and Riverside Parks in downtown Easton. In addition to the more than 60 artists and crafters who will be displaying, demonstrating and selling their works, the festival will feature the popular Plein Air Art Contest, children’s activities, and two stages of live music. Scheduled performers include guitarist and Blues Hall of Fame inductee Tom “The Suit” Forst, Big Easy Easton Brass Band, Roi and the Secret People, The Moondogs, October Rose, and Cubbage, among others. Other festival highlights are the “Hair as Art: Flow” contest and the “Food As Art: Wing Wars” competition. The former will have participating licensed stylists vying for the best flowing locks look in three categories: natural, augmented, or mannequin. Heller said the festival has evolved into a celebration that encompasses a wide swath of the arts, stretching beyond traditional genres and boundaries. Riverside Festival of the Arts, which was first held in 1997, is a function of the Arts Community of Easton. This year’s event will also include a raffle contest in which the winner will walk away with a C.F. Martin & Co. OMC-16E acoustic guitar, pack of strings, and hardshell guitar case. For a full itinerary of events and more information on the Easton Riverside Festival of the Arts, visit eastonriversidefest.org or check out the eastonishome.com blog. Easton Riverside Festival of the Arts will be held 10 a.m. to 5 p.m. Sept. 15-16 at Riverside and Scott Parks off of Larry Holmes Drive in Easton. Admission is free.